This past Sunday I celebrated my 39th birthday and although I know they say age is only a number I’m really starting to feel the effects of getting older. For example: I’m starting to forget things…simple things…like buying the sugar I needed to make my cake. I know it sounds minor but when you’re all set to bake and realize you’re missing an essential ingredient it’s truly a hassle. And I can’t stop thinking....how could I forget sugar? Deciding on what kind of cake to make had been hard enough. I knew I wanted chocolate and some sort of cherry filling but I just couldn’t find the perfect recipe. One or more of the components, in every recipe I found, just wasn’t right. So after going through tons of cookbooks I ended up piecing together a cake of my liking from various different sources. It wasn’t until I had preheated the oven and had most of the ingredients measured out that I realized I had forgotten to buy the sugar. I wasn’t about to run back out to the store (I’m old, remember) so I started digging through the pantry. I found a box of Sugar In The Raw; the front of which said that it was “perfect for baking." I thought to myself “this could work”... so I tried it…and it worked fine. Just think I never would have known to substitute Sugar In The Raw if I were younger and didn’t forget simple things like buying sugar. So getting older might not be all that bad. They say you live and learn…I guess that’s true. 1. Heat oven to 350°F. Grease and flour your pan. 2. Stir together flour, cocoa, baking soda and salt in large bowl. 3. Cream butter and sugar in a mixing bowl at medium speed. Add eggs one at a time mixing after each addition. Add sour cream beat well. Alternate between dry ingredients and water mixing just until combined. Pour batter into prepared pans. 4. Bake 50-60 minutes or until wooden pick inserted in center comes out clean. Cool 10 minutes; remove from pans to wire racks. Cool completely. In a small bowl, cream butter. Add cocoa and confectioners sugar alternately with milk; beat to spreading consistency. (additional milk may be needed) blend in vanilla. Happy Belated Birthday!! What delicious cake! Moist and chocolaty! I think I'm in trouble - I'm turning 32 this year and already forget everything! It's going to be scary for me when I'm 39!!! Happy birthday - the cake sounds amazing. I followed you from my blog. How could I not check out the "Food Hunter"? Your concept here is awesome, and really important as we all fight against the garbage we're fed everyday. Happy belated birthday! My 39th is next month and ever since having kids, my memory has gone down the drain. Doesn't sound like it's going to get any better! Happy birthday! Thanks for the comment, your chocolate cake sounds devine! Awesome! Sounds a lot like my Dark Chocolate Texas Sheetcake! Hey, don't worry... I'm almost 46 and life just gets sweeter! Happy 39th! Hope you had a wonderful day, I've been celebrating my 39th for at least 10 years now! Belated Happy Birthday! As long as you can remember to eat chocolate cake, who cares what else you might be forgetting? Happy belated birthday! That chocolate cake looks like an awesome way to celebrate. Happy Birthday! I'm making a new rule: starting now, the older you are, the more cake you get to have! That chocolate cake looks good! I always hate it when you are just about to start making something or worse yet, you are already making it and you realize that you don't have one of the ingredients. A happy belated birthday! I know what it feels like to have 40 just around the corner - this is my year and I'm not looking forward to it but chocolate cake makes everything better. That cake looks amazing as do the pizzas in the other post! Happy belated birthday! 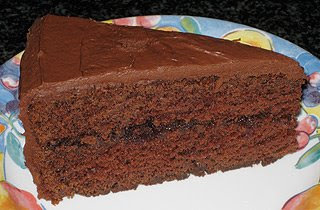 I can't think of a better way to celebrate than with a fantastic chocolatey moist layer cake. love chocolate cakes.looks perfect..moist and with just right amount of sweetness.. I have been looking through your desserts and you have some winners here. I have to come back when I have the time and take down some of these recipes. Thanks for sharing these. I tried this cake a couple of weeks ago (without the cherry filling) and it turned out really good. It was very moist and had a nice texture.